Your precious artwork has finally been restored, and you can take it back to the comfort of your home. You can hang it anywhere, so that everyone who visits will enjoy it as much as you do – can’t you? Not quite. As we mentioned in our article, ‘How to Store and Display Your Artwork’, there are some crucial dos and don’ts for displaying your artwork for you and your guests’ enjoyment. After time and money spent repairing your artwork it’s important you can view it properly, and, in more ways than one, see it in the best light. Lighting artwork is a crucial finishing touch. If not done correctly, it can consequently cause damage. By avoiding the pitfalls of bad lighting, your artwork can bask in the glow of museum-quality illumination. Placing artwork in the path of direct sunlight exposes it to UV and infrared light, and will cause fading. Ensure that the artwork is positioned away from natural light sources to avoid this. Halogen and other commonly used incandescent bulbs produce UV and infrared light and heat. The harm this can cause to delicate artworks is significant. UV and infrared light are not found in LED lighting which makes it a much safer option, provides improved light distribution for your artwork, and means increased energy savings and lower costs for you. A professional art lighting company, such as TM lighting, can provide specific guidance on choosing the right LED to best showcase your artwork and give the richest definition. A poor quality LED won’t highlight the nuances and details of your painting in the same way that an LED which reproduces 100 per cent of the colour spectrum will. TM lighting advises that for the optimum light in a home environment, use a colour temperature of 2,700K and a colour rendering index (CRI) of 95 or above. It’s your personal preference when deciding on the type of light that will illuminate your artwork. 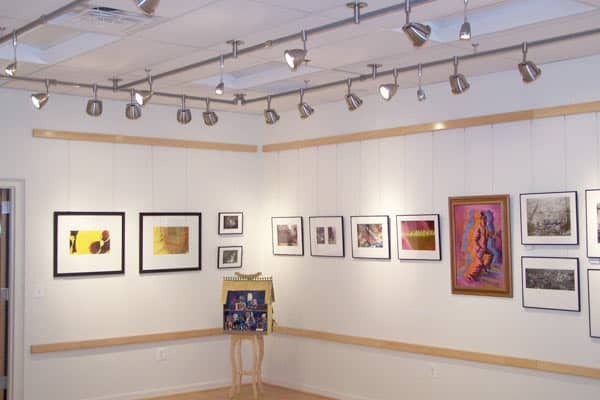 A track system and spotlights is the best option if you have appropriate ceiling and wall space, and would like to move your artwork to different locations. For this reason, many galleries and museums are inclined to use tracking lights for their artwork collections. The distance and height created by using track lights also casts a wider beam over the artwork. 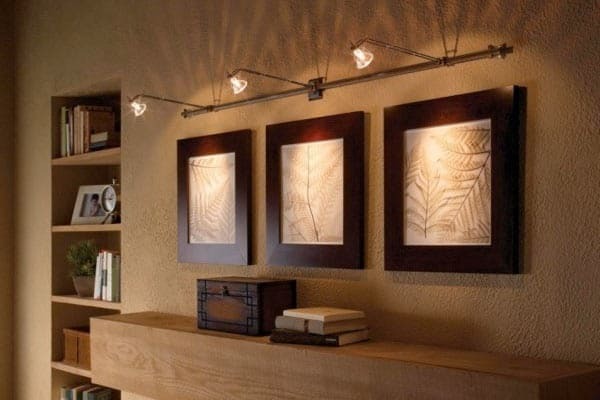 For single artworks, picture lights can create a dramatic effect and a distinguished focal point. Picture lights placed on walls can also create a layered lighting effect and a warm ambience to pick out the precise colours of the artwork. The right picture light can also highlight the medium of the artwork. For example, with a textured acrylic painting, the lighting can carefully fall on the dimensions of the piece and make it a stand-out feature of the room. Lighting Position – Uplight or Downlight? Uplighting or downlighting can also be personal preference, but advantages exist to both options. Uplighting can create shadows, especially if the surface is textured or has a decorative frame. Certain works of art can feel the benefits of either option, however, depending on the scene in the painting and its composition. It’s important to light the painting as a whole, however, so that the top isn’t heavily lit when the bottom isn’t, and vice versa. The lighting should be complementary and highlight certain details, but not neglect areas. 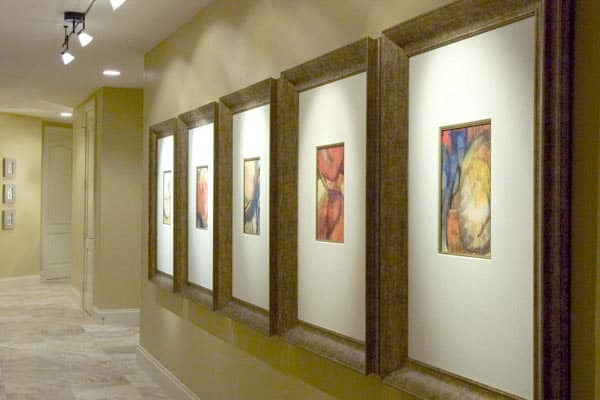 As mentioned above, uplighting a painting that has a decorative frame or a textured surface can cast shadows. In this instance, and for works under glass, positioning the lighting to create a less steep angle can mitigate this.